After 20 years of excavating, cleaning, reconstructing and casting, the oldest virtually complete human ancestor in South Africa was finally unveiled on Wednesday. 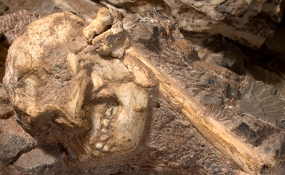 The skeleton of Little Foot, who wasn't so little at the time of her death, was unveiled at the University of Witwatersrand's Evolutionary Studies Institute. The man behind the epic discovery, Professor Ron Clarke, said Little Foot was nicknamed by Professor Phillip Tobias. "If that one small bone wouldn't have been found then we wouldn't have Little Foot," he said. He described the discovery as being "one of the most remarkable fossil discoveries made in the history of human origins research". Clarke said every hominid fossil that was discovered was important to the understanding of our ancestors. Clarke, who began his paleoanthropology career in Kenya in 1963, said Little Foot was by far the most complete skeleton of a human ancestor, older than 1.5 million years, ever found. It is also the oldest fossil hominid in Southern Africa, dating back 3.67 million years. He could tell by her teeth that she was an elderly woman when she fell to her death. Clarke took the gathering along on his journey of how he made the extraordinary finding. One day he was going through boxes of cleaned out fossils collected by Professor Phillip Thobias and Alan Hughes, when he found an ankle bone of a hominid. Three years later, in another box, he uncovered more bones of the same foot and some bones from the opposite legs. Clarke realised that he had discovered bones from both feet and lower legs of one Australopithecus individual and that it had come from a very deep place in the Sterkfontein caves - 40km north west of Johannesburg. "We estimated it to be more than three million years," he said. He then realised that the whole skeleton must still be in the cave. "I said: 'Wouldn't it be marvellous if we could find it?'" And so the task began. The cave was deep underground and it was dark. "The chances of finding it were very, very remote. I gave the cast to two of my assistants and said they should go into the cave with the piece and see where this piece could fit in." Remarkably, after one-and-a-half days of searching, his assistant Stephen Motsumi, had some news for him. Clarke rushed to the site and when he arrived, Motsumi asked him: "You know that bone that you asked us for? Well, we think we found it." He went down into the cave, in the dark, and Motsumi was shining the torch and pointed to the right place. "We got there, I tried to fit it on, I turned it around and eventually it clicked and fitted perfectly. And then I found that the other foot fitted on the other side." Clarke said it was dramatic because researchers had expected to find a whole skeleton lying there, but it was in very hard concrete. They continued to chisel away and uncovered the lower leg, right up to the thighs, and that was it. "We said this is incredible. How can there be no more of this skeleton? We became very disappointed." The only explanation Clarke and his team had for the missing bones was that they had collapsed to a lower level. "We chiselled through that stone and one day Stephen's chisel uncovered some bone. It turned out to be part of the back of the skull and, at that stage, we thought we had found the skull and the rest of the skeleton and we should announce it to the world." And so they did in a South African journal and that opened the floodgates. The announcement sparked a lot of interest and the digging temporarily stopped as throngs of people demanded to see the discovery. Another reason the process took long was because the team was excavating in the position that the skeleton was in so as to not damage the bones. Clarke, who had been described as a paleosurgeon, said surgeons take an oath that they would not harm their patients. "If I am a surgeon, then my patient is the fossil on which I am working and I pledge to do no harm to it and I refused to be pushed. Even though people were harassing me, asking me why it took so long, I turned a deaf ear and continued slowly." Clark and his team found that Little Foot had legs longer than her arms which meant she was "like us", he said. He added that evidence showed she walked upright. Clarke was visibly elated that the day had finally come and so were his assistants, Andrew Moyagabo Phaswana and Abel Kgama Molepolle, who also worked with him on the project. Phaswana said: "I am very happy because I learnt many things each and every day from Ron. I am happy because now I can tell the new generation what is going on with Little Foot because of Ron." Molepolle added: "I am very happy working with Professor Ron Clarke for many years. More than 15 years. He has shown me how to clean the fossil and how to make a cast, so I am very happy."